Steven Spielberg can make pretty much any movie that he wants to. The days of his wide-eyed fantastical movies like E.T. the Extra-Terrestrial, Raiders of the Lost Ark, and Jurassic Park have given way to his love of historical dramas such as Saving Private Ryan, Schindler’s List, and Lincoln. Just as one would suspect, Bridge of Spies is the latter. Set in 1957 at the height of the Cold War, Bridge of Spies stars Tom Hanks (Captain Phillips) as James B. Donovan, an insurance lawyer who finds himself in the awkward position of being asked to defend a suspected Soviet spy named Rudolf Abel (Mark Rylance from Anonymous) when he goes on trial for espionage. The trial is, of course, just for show, and Abel is convicted, but Donovan convinces the judge to spare his life in case an American spy is ever captured by the Soviet Union and the two countries want to arrange a swap. Sure enough, that’s exactly what happens; Francis Gary Powers (Whiplash‘s Austin Stowell) is shot down in his U-2 spy plane and captured, and Donovan is tapped to negotiate the prisoner trade. 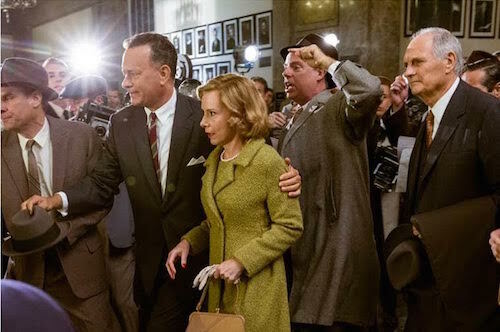 Bridge of Spies is not as stuffy of a movie as it sounds. Of course, it is basically a legal thriller about a hostage negotiation, but the screenplay was written by television writer Matt Charman (“Black Work”) and then re-written by Joel and Ethan Coen (No Country for Old Men, Fargo), so it’s surprisingly suspenseful, more cloak & dagger than ink & paper. Donovan is the only true protagonist in the film; there is an air of suspicion and distrust that surrounds every other character, whether they’re American or Soviet, and that just makes the film tenser and tenser as the stakes are raised higher and higher. The audience (as well as the character) never knows whether or not Donovan will be double-crossed (and, if so, by whom), and that keeps them on the edge of their collective seat. Not bad for a movie whose leading man is an insurance lawyer. In many ways, Bridge of Spies is textbook Spielberg. It’s a tight story, it’s based on actual events, and it features great performances by the entire cast. The cinematography has a period style without sacrificing a modern look, and the film is skillfully edited with an eye for the dramatic. It falls somewhere in the middle of the Spielberg Scale – more fun than an Amistad or a War Horse, but not as uproarious as a Duel or a Jaws. As an added bonus, it stars Tom Hanks, which is never a bad thing. Bridge of Spies is well worth a look. One would not think that a movie like Bridge of Spies would be an action thriller, and it really isn’t, but there is one scene in the film that is extremely visceral, and it deserves to be spotlighted. A few weeks ago, I touted the plane crash segment from The Green Inferno as the greatest air disaster scene ever filmed, and that is still accurate, but the scene in which Francis Gary Powers’ U-2 spy plane is shot down in Bridge of Spies gives it a hard run for its money. It’s a visual effects bonanza, from the impact of the missile to the inevitable crash and pilot ejection. It’s exciting, too. For a few brief moments, there’s some real pulse-pounding thrills in the middle of all of the legal defenses and tense negotiations. It’s only one scene, but it’s the clear show stopper.